As the end of the year approaches, many of us find ourselves queueing up at the airport for that time honored tradition: holiday travel. Whether you’re flying inter-island or across the world, the last thing you want is to spend your holiday sick in bed. To keep yourself in top form, try these tips to fend off colds and flu as you travel. Give yourself the gift of sleep. Getting enough z’s isn’t just about beauty (though there’s something to be said for that too), but also about fending off illness. Sleep and circadian rhythms are closely tied to immune function and response - so the more you’re able to get your 8 hours of sleep, the better. Drink up. Similarly, hydration is a crucial part of staying healthy - and speeding up recovery if you’ve caught a bug. We like to add a couple of slices of lemon to hot or room temperature water for flavor and a bit of extra vitamin C. Don’t forget that caffeine has a diuretic effect...so be sure to pair any coffee or energy drinks with an extra glass of water. Be careful what you touch. Airplanes and airports are by definition high traffic places, with hundreds or thousands of people coming into contact with a given surface in a single day. To minimize the risk of cross-contamination of bacteria or viruses, wash your hands frequently, and avoid touching high-use surfaces like doors, handles, entertainment system controls, and the like. If you must use one of these (like the bathroom door!) use a tissue or other barrier to avoid direct contact. Take cover. The dry air inside a plane cabin can leave your nasal passages especially vulnerable to bacteria and viruses. Give your respiratory system an extra layer of protection with a disposable surgical mask, which will keep illness causing bugs out of your nose and mouth. Sure, you may feel self conscious - but it’s a small price to pay for staying healthy. 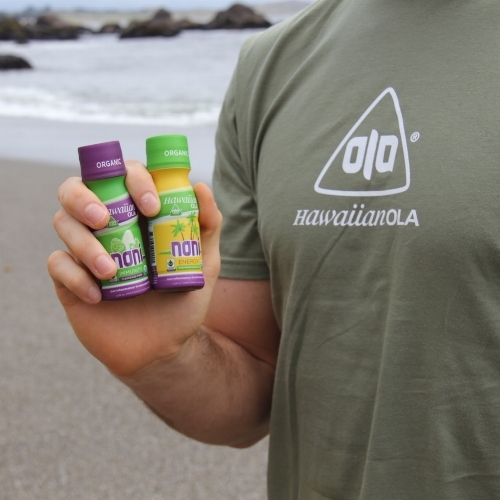 Shore up your system with noni. Here in Hawaii, noni fruit has been used for hundreds of years for its many health benefits. In particular, noni juice contains Noni PPT, a unique compound only found in noni that has been shown to support a healthy immune system. Our noni immunity shots contain a full serving of organic Hawaii grown noni, blended with a delicious fruit juice blend. Best of all, they come in convenient 2.5 oz single serving bottles. That means you can bring them in your carry on luggage for noni before, during, and after takeoff! If you're looking for a convenient and delicious noni supplement, look no further. Find them in retail stores or buy them online. Wherever you’re going this holiday, or even if you’re staying home, we wish you the very healthiest and happiest of holiday seasons! Celebrate the H-OLA-days with healthy cocktails!